We had some ground pork thawed for dinner and I was considering what to make with it. Fried rice? No. Pork burgers? No. Asian pork meatballs. No. Then I thought of using it with some type of curry. What I ended up making was ground pork slow-cooked in a bath of Massaman curry and coconut milk. I actually cooked it very much in the style of a rendang, by slowly simmering the pork in the coconut-curry mixture until the coconut milk is absorbed by the meat or gently cooked off, leaving a thick and flavorful curry coating on the meat. It was very easy to make, though it does take a long time to cook, but with minimal active time, just checking on it every 30 minutes or so as it cooks. 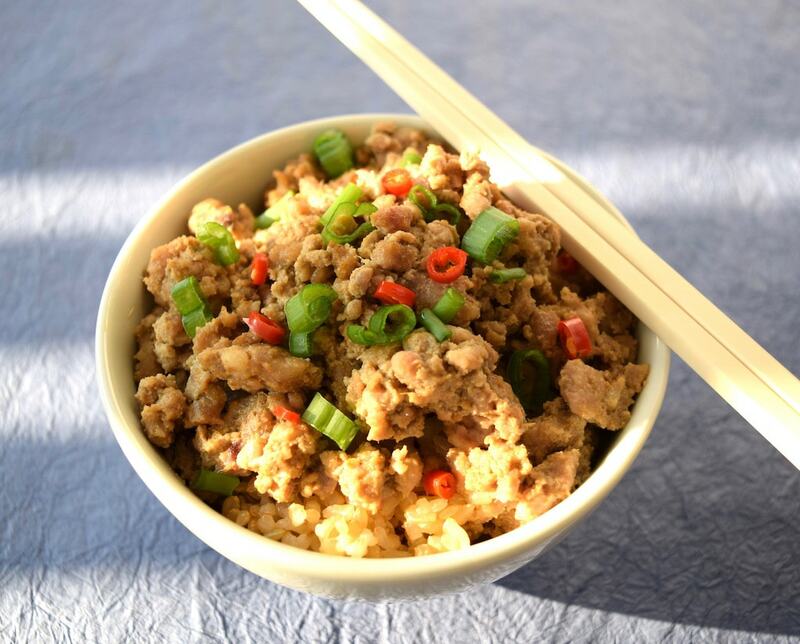 It’s better to use lean ground pork for this dish, but the instructions explain how to deal with making it with fatty pork. 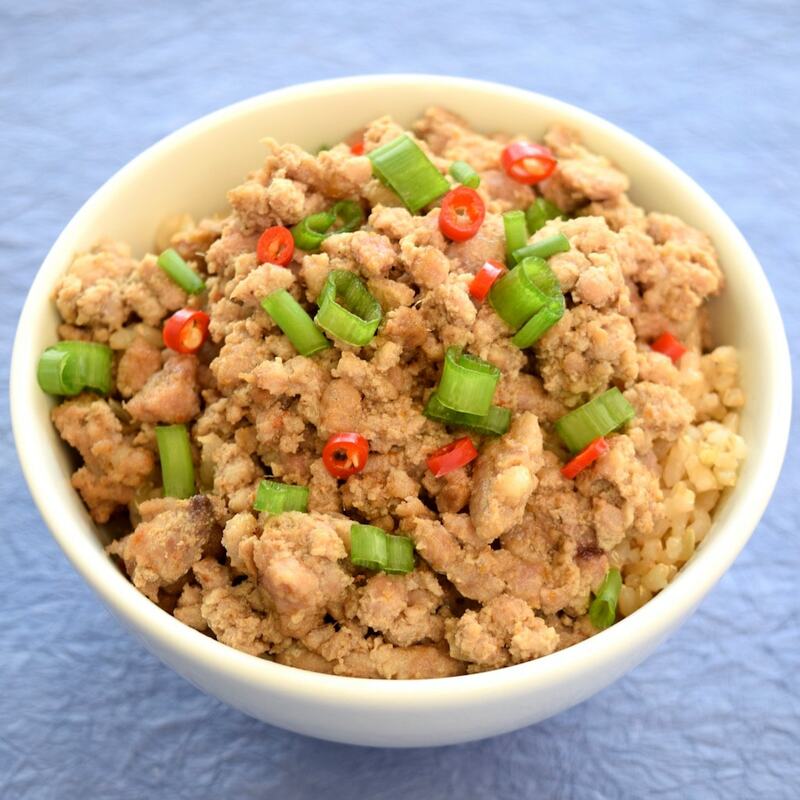 Massaman curry ground pork is best served over rice or noodles of some kind. 2-4T of your favorite curry paste. I used a mild Massaman paste. Use your palate to determine how much paste to use. Add the coconut milk to a large fry pan over low-medium heat. Add the curry paste a tablespoon at a time and mix it in to dissolve into the coconut milk. Keep adding until it’s the right amount of flavor or heat for you. Add the ground pork, breaking it up and distributing it evenly in the pan. Bring the coconut milk to a low simmer. Allow it to slowly simmer for up to a couple of hours, checking on it every 30 minutes or so, until the coconut milk is mostly evaporated. Now check every 10 minutes until the coconut milk is gone and the meat begins to gently brown. If there is oil in the pan from the meat or coconut milk, pour off as much as you can before pouring the entire contents of the pan into a large sieve or fine colander. Let it sit for a few minutes so the oil can drain out. When done, return it to the pan. Serve over rice and sprinkle with sliced green onion and Thai chilies (with seeds for hot, seeded for less heat).